Connie Helke is amazing and generous, and we love her! Because of high interest, she has agreed to hold another class at her studio, to benefit Marine Mills Folk School! Your class fee will go 100% to supporting our new folk school, as Connie is donating her time. Be one of the lucky few to spend an afternoon with Connie, learning to create a functional mug complete with handle. You will learn to roll out a slab of white stoneware clay, cut, add texture and then form it into a mug with handle. The class will take place at Connie’s studio and will be limited to only 4 adult students, so register soon! Students will return for an hour in 3-4 weeks, date to be mutually agreed upon, to glaze their mugs after they have been dried and bisque-fired. 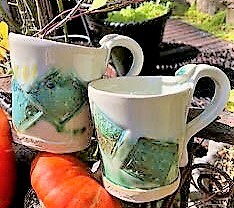 After glazing mugs will be fired in Connie’s kiln once again to create a mug that is dishwasher, microwave and oven safe.